I wonder if my reflexes have slowed now that I’m in the MA 50 division of traveling disc golf correspondents? 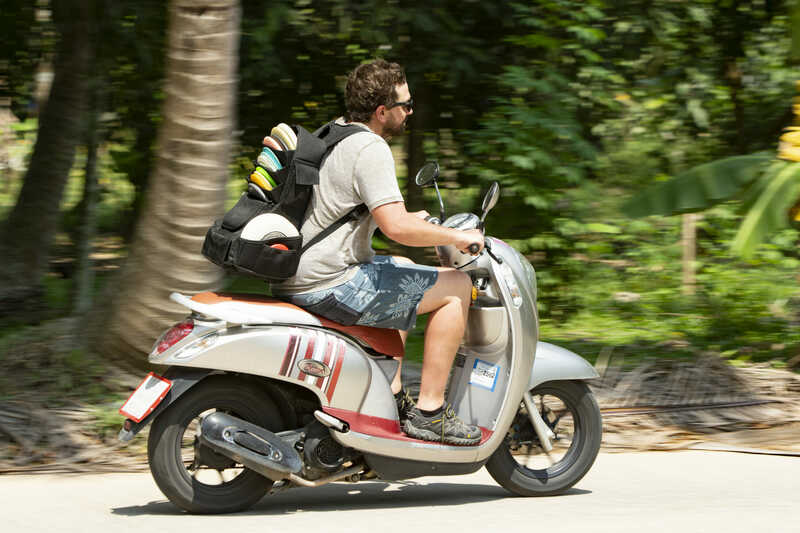 I pondered this as I pulled my newly rented 125cc scooter out into the helter-skelter bedlam of Thai traffic for the first time. I wasn’t sure what to do at first, but then a truck blasted past me, a shot of adrenaline cleared my mind wonderfully and I instantly remembered how things work on the roads here. “No way I’d ride here, it’s chaos,” is something I’ve heard a few times. But, as French mathematician Jules Henri Poincaré would agree, there is a hidden order underlying the apparent craziness. It’s all about the points of reference. In Western countries, these are fixed objects, like lane markings, road signs, and traffic lights. Everyone obeys these and mostly get along. But in Asia, those “fixed objects” are merely a rough guide to how you might express yourself on the road. Your reference points instead are other people. You move according to how they move, in a more liquid, or organic, flow. So just relax, stay aware of what’s around you, who might be coming in off a side street and who might be coming up behind. Let people in and expect them to let you in. See yourself as part of a moving stream. Try not to die. I remember the line from Lee Emery’s drill instructor character in Full Metal Jacket. “You will give your weapon a name! You will make it a girl’s name!” So I’ve named my little 125cc Honda “Tracey” after the girl who sung all the way home from school on the back of my bike when I was a kid. Tracey and I took the long way around the island yesterday. 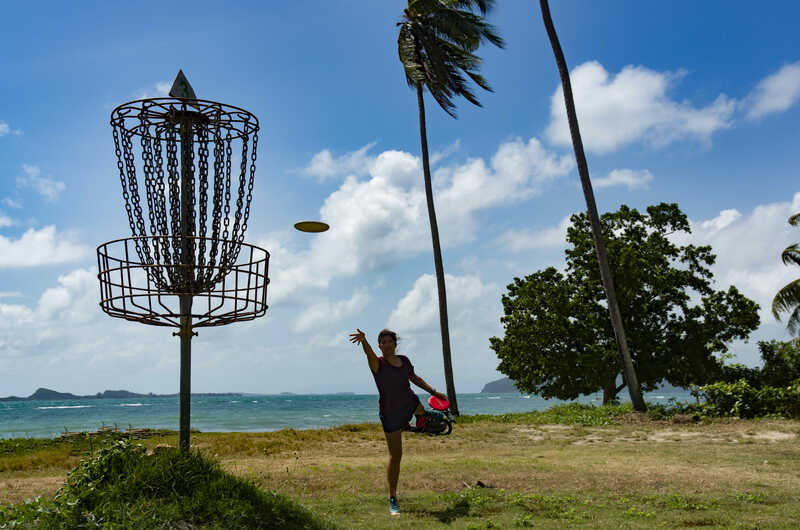 Along some quieter roads down the west coast — where flashes of white beach and turquoise ocean will show through the palm trees — to the Laem Sor Beach Disc Golf and Acoustic Café on the south end of the island. Laem Sor is the course with the beach-side pin placement that’s already made the Innova Calendar and a thousand Finnish disc golfing Instagram accounts. It’s a beautiful little 9-holer among the coconut groves that skirt the ocean, and there’s a funky little clubhouse that makes the second half of the name. I was sitting in the shade, under a fan and enjoying the occasional cooling waft of breeze off the water, talking to a couple of British expats about disc golf. Among the 4,000 farang1 who now make Koh Samui their home, Neville and Roger, both retired, were quite taken with this new sport they’d never seen before and they’d lucked out to get an Aussie disc golf writer to explain it to them. Just as I was expounding on the finer points of disc design, Tabea Wallus (80405) and View Georgiou (77395) came in with their partners. Ever since a barman in Vietnam introduced himself to me as “George Clooney” I’ve understood the Asian propensity to have an alternative name. It’s less tiresome than having to teach each and every new farang they meet how to pronounce it. But in Thailand, there’s a little more to it. The second name is part of a custom that dates back to the Kingdom of Sukhothai in the 12th and 13th century and is usually bestowed by the parents along with the official birth name. So that’s why Phattharachari Khamsriphon considers “View” as much her name as Phattharachari. Always an athletic, sport-loving kid, View was a badminton player who then trained as a Muay Thai fighter (3 bouts, 2 wins, 1 draw) before discovering disc golf with her expat Brit husband Nick Georgiou (77393) four years ago. Like a lot of disc golfers with a martial arts background, she has a well-honed understanding of how to generate rotational power and apply it with precision. View is a fierce competitor though and has gradually learned to channel her aggression differently to when there’s an opponent to be kicked and punched. 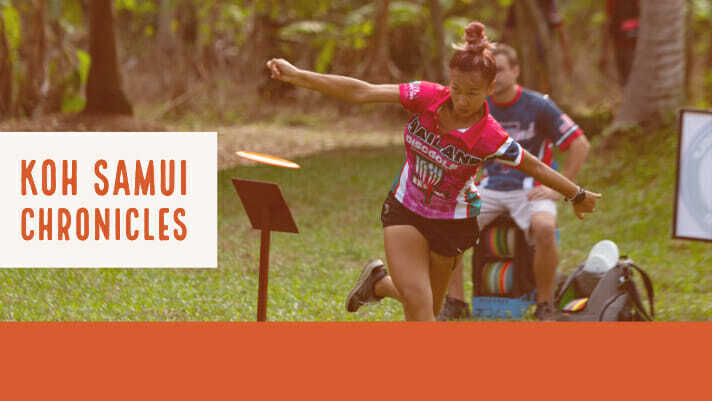 Recently picked up as a sponsored player by Prodigy Disc, she and her husband will soon be moving up to her home village of Udon Thani near the Thai Laos border and away from the Thai disc golf hot spot of Koh Samui. This may seem like a strange move for someone on the cusp of her new career. That touring begins this year when View will travel to Europe for the first time. Georgiou will get a taste of European competition this weekend in the Samui Swine Classic VI with Tabea Wallus. The Swiss tour champion is making The Hogfather the last stop of a three month southeast Asian trip with partner Alexander Kicinski that’s included Cambodia, the Philippines, and Vietnam. After that, the PE/Maths teacher will be back to work and getting ready for the start of the European tour. She’s got her sights on the Tali Open and is waitlisted for the European Open and, like her new Thai friend, is waiting to see how she performs in those before making long term plans. She doesn’t rule out a trip to the world championships one day. On the ride back up to the north end of the island which will be the hub for this weekend big event. I spied a few more disc golf backpacks on the back of scooters. Still an incongruous sight in this part of the world. But becoming less so every day. It’s no secret that many travel to this part of the world because of its permissiveness. Thailand has a very allowing culture. So when they see a bunch of farang who’ve traveled thousands of miles to throw frisbees among the coconut palms, it doesn’t exactly move the needle on their weirdness scale. It’s possibly why disc golf has found a home here first, ahead of anywhere else in SE Asia. Chohk Dee2 to all of this weekend’s competitors. 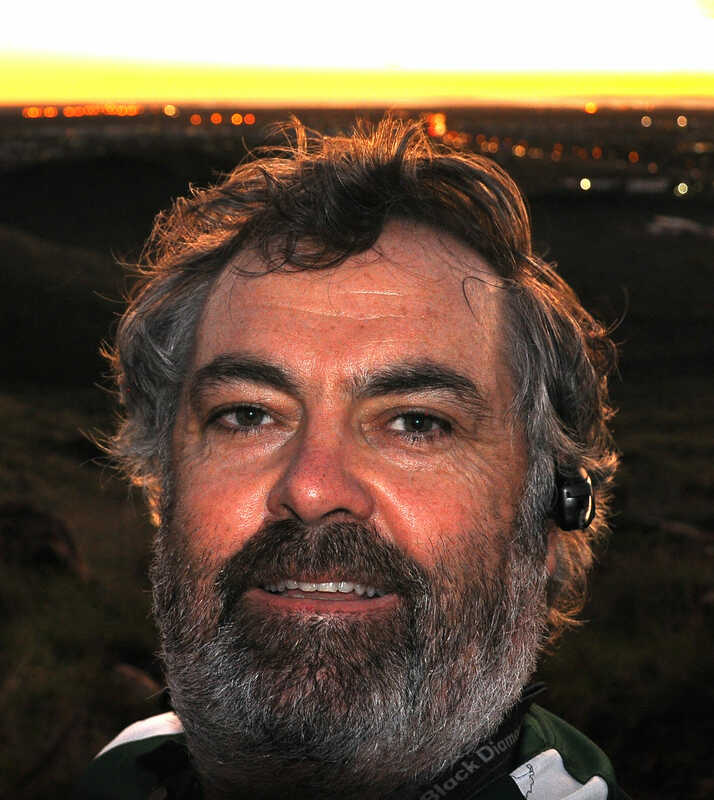 Kingsley Flett is a writer, photographer, and disc golfer who lives in Western Australia. You can find some more of his work on Instagram. He told us that he rides a Kangaroo to work every day, but we don’t believe him. Comments on "The Koh Samui Chronicles: Part Two – Make It A Girl’s Name"